Ron was born in Geelong on the 5th January, 1931 to John James Young and Nellie Cecilia Murphy. He was one of seven children and lived in and around Western Victoria for many years. In 1936, prior to World War II, Ron’s 14 year old brother, Terrence, was tragically killed in a Sawmill accident. After the beginning of the war, the Young family moved to Fitzroy North. During which time his father worked in an Ivanhoe sawmill and the family, along with many others of the era, faced some very difficult times. Ron was a strapping young lad, 6 feet tall and well built. He tried and almost succeeded in joining the army hindered only by his mother’s tip off to local recruiters at the time, to his mere 13 years of age. In 1945, the family moved to Healesville, Victoria, where Ron, like his father, began his working life in the bush, logging and working in Sawmills. It became necessary for Ron to live away from home during the week, often traveling all over Victoria to find work in the bush. He was married in 1950 to Estelle Mary Morse, and in the years that followed, became the proud father of six children; Denise, Rhonda, Judy, Terence, Michael and Colin. 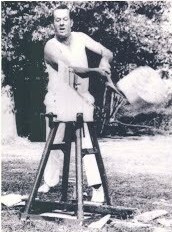 Ron was introduced to the sport of Woodchopping by Jack Ayres during his teens, however he did not return to the sport until his early thirties after injuries forced him to retire from his other love, football. Ron returned to Woodchopping to find his love of competition and unearth a competitive spirit that would follow him through the rest of his life. With the help and encouragement of many experienced axemen and soon to be friends, Ron gained success fairly quickly which proved a great motivator for the rest of his career. True to his competitive nature and much to the amazement of those who knew him, when a couple of ‘Old Timers’ told Ron that he would never be any good unless he ‘gave up the smokes’ and improved his lung capacity, Ron who had been a smoker all his life, promptly gave up the habit. He was very determined and throughout his entire life, endeavored to be the best that he could be in his chosen sport. every small town had an agricultural show and hence a woodchop, Ron would pile his children into the back on the car and attend as many of these events as possible. He competed in all disciplines; the Standing Block, Underhand, and Tree Felling, until his late sixties where his expertise as an exponent of the chainsaw was brought to the fore. Ron achieved a great number of wins in both Victorian and interstate competitions and was very proud to have represented Australia in Hong Kong and New Zealand in the 1970’s. 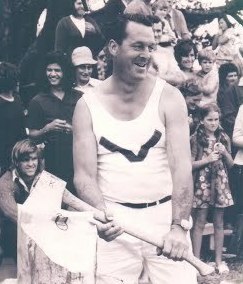 Ron captained a Victorian team in New Zealand and also competed in the World Masters Games returning with a bagful of Gold, Silver and Bronze medals. For many years, Ron was the supplier of logs for the Central Victorian Axemen’s Association, a great number of country shows as well as the Royal Adelaide and Melbourne Shows. 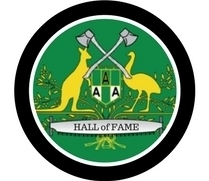 He had a 50 year association with the Royal Melbourne Show as the Chief Supervisor of the Woodchopping Events and its ground staff. He ensured that everything ran smoothly, was clean and on time prior to and during the Show. Most memorable were his talents on a front-end loader, in particular when faced with very little space and time or when placing tree poles. Ron passed away in 2007 aged 76 years and worked at the Melbourne show until 2005. At this time, his son Michael took over his position, made possible with the knowledge that he had received over a lifetime in and around Woodchopping with his father. A great ambassador for the sport of woodchopping both competitively and behind the scenes, Ron was a strong supporter of the Victorian Police Axemen’s Association, a founding member of the Healesville Axemen’s Club, life member, past president and committee member of the Central Victorian Axemen’s Association, a regular competitor on HSV 7’s World of Sport and was always willing to help new axemen to learn the sport. He ran and organised woodchops at the Marysville Woorianda Festival, Millgrove Sports on Melbourne Cup Day, Healesville Football Club, Healesville High School and with his wife Estelle, helped run the Axemen’s Dinners held at the completion of the Melbourne Show. Ron and Estelle also organised fundraising woodchop events at the Healesville Hospital Carnival for more than 25 years, a contribution that was recognised with a Life Governorship of the Healesville Hospital. 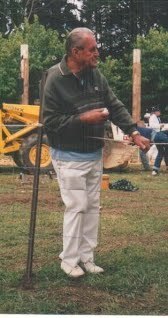 With the help of his children, Ron continued to run woodchop events for the hospital after Estelle’s death in 1992.